The chart design is the Nicholas Dobreé 1746 sea chart, commissioned by the Lord High Admiral of Great Britain after the loss of HMS Victory on Black Rock just off the Casquets in 1744. We have now received our latest set of merchandise. This time Committee members Rob Grant and Keith Pike have chosen old black and white prints of Guernsey’s past. 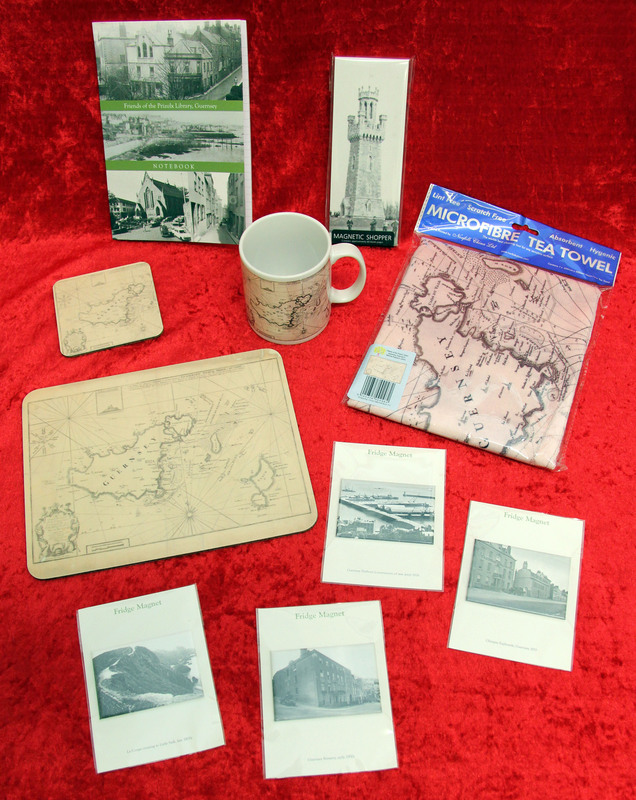 reminder notes and depicts Victoria Tower. The A5 Notebook has a front cover of four old Guernsey prints and blank pages for notes or longer scribbles. Finally, there are four fridge magnets with different old Guernsey scenes. They are in presentation packs and in this photo look much larger than actual. All these new items can be viewed at the Library and are sold at £3 each. They can be bought from the Library staff. On order are new mugs depicting two sheets of the Guernsey Press from May 9th 1945. They will be available for purchase soon. We will inform Members when they arrive.